Hand-propelled wheel cart, Indus Valley Civilization (3000–1500 BCE). Housed at the National Museum, New Delhi. 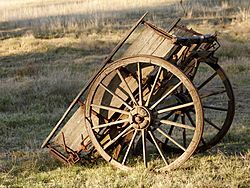 The history of the cart is closely tied to the history of the wheel. Carts were often used for judicial punishments, both to transport the condemned – a public humiliation in itself (in Ancient Rome defeated leaders were often carried in the victorious general's triumph) – and even, in England until its substitution by the whipping post under Queen Elizabeth I, to tie the condemned to the cart-tail and administer him or her a public whipping. 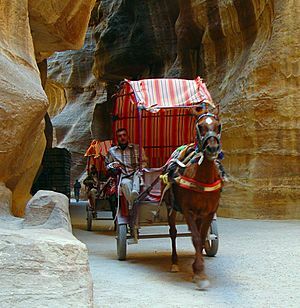 Larger carts may be drawn by animals, such as horses, mules, or oxen. They have been in continuous use since the invention of the wheel, in the 4th millennium BC. Carts may be named for the animal that pulls them, such as horsecart or oxcart. In modern times, horsecarts are used in competition while draft horse showing. 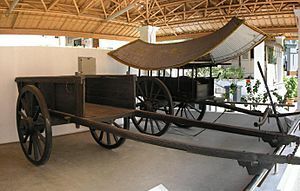 A dogcart, however, is usually a cart designed to carry hunting dogs: an open cart with two cross-seats back to back; the dogs could be penned between the rear-facing seat and the back end. float: a dropped axle to give an especially low loadbed, for carrying heavy or unstable items such as milk churns. The name survives today as a milkfloat. ralli cart: light, two-wheeled, horse-drawn, for two persons facing forward, or four, two facing forward and two rearward. The seat is adjustable fore-and-aft to keep the vehicle balanced for two or four people. 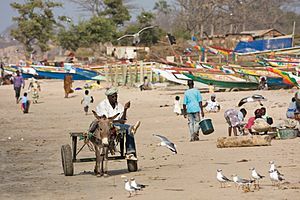 The builder of a cart may be known as a cartwright; the surname "Carter" also derives from the occupation of transporting goods by cart or wagon. 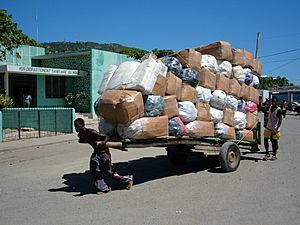 Carts have many different shapes, but the basic idea of transporting material (or maintaining a collection of materials in a portable fashion) remains. Carts may have a pair of shafts, one along each side of the draught animal that supports the forward-balanced load in the cart. The shafts are supported by a saddle on the horse. 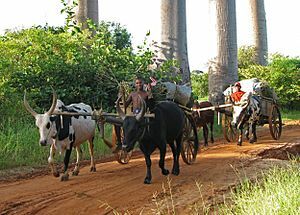 Alternatively (and normally where the animals are oxen or buffalo), the cart may have a single pole between a pair of animals. The draught traces attach to the axle of the vehicle or to the shafts. The traces are attached to a collar (on horses), to a yoke (on other heavy draught animals) or to a harness on dogs or other light animals. Traces are made from a range of materials depending on the load and frequency of use. Heavy draught traces are made from iron or steel chain. Lighter traces are often leather and sometimes hemp rope, but plaited horse-hair and other similar decorative materials can be used. The dray is often associated with the transport of barrels, particularly of beer. Of the cart types not animal-drawn, perhaps the most common example today is the shopping cart (British English: shopping trolley), which has also come to have a metaphorical meaning in relation to online purchases (here, British English uses the metaphor of the shopping basket). Shopping carts first made their appearance in Oklahoma City in 1937. In golf, both manual push or pull and electric golf trolleys are designed to carry a golfers bag, clubs and other equipment. Also, the golf cart, car, or buggy, is a powered vehicle that carries golfers and their equipment around a golf course faster and with less effort than walking. A Porter's trolley is a type of small, hand-propelled wheeled platform. This can also be called a baggage cart. since the 13th century. Autocarts are a type of small, hand-propelled wheeled utility carts having a pivoting base for collapsible storage in vehicles. They eliminate the need for plastic or paper shopping bags and are also used by tradespersons to carry tools, equipment or supplies. A soap-box cart (also known as a Billy Cart, Go-Cart, Trolley etc.) is a popular children's construction project on wheels, usually pedaled, but also intended for a test race. An electric cart is an electric vehicle. A Chinese Sui Dynasty (581–618 AD) cart figurine pulled by a bull. 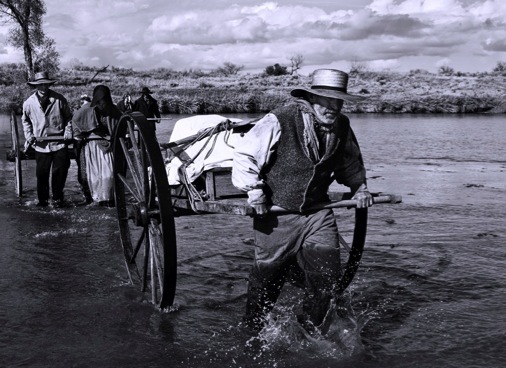 Mormon handcart pioneers crossing the Platte River, modern reenactment of 1856 expedition. A walking cart, used for long distance travel, seen at Michigan's Mackinac Bridge. Cart Facts for Kids. Kiddle Encyclopedia.